Finally I am able to share my card where I tried to use Vaseline to blend Prismacolor pencils. Judy Krembs Jung shared a video on her facebook showing how Vaseline helps blend colors using Prismacolor pencils. Vaseline also enhances the intensity of the colours using the pencils. I was intrigued. Having both Prismacolor pencils and Vaseline in my stash, I decided to have to give it a go. To be honest, I was skeptic. I thought the colour will bleed and the cardstock will get messy with the Vaseline. But without trying I wouldn’t know, would I? But to my surprise, Vaseline worked very well. I found the colours blended very easily and the intensity of colour was indeed enhanced. No mess what so ever. I simply dabbed off the Vaseline with paper towel. Here is the card for you. 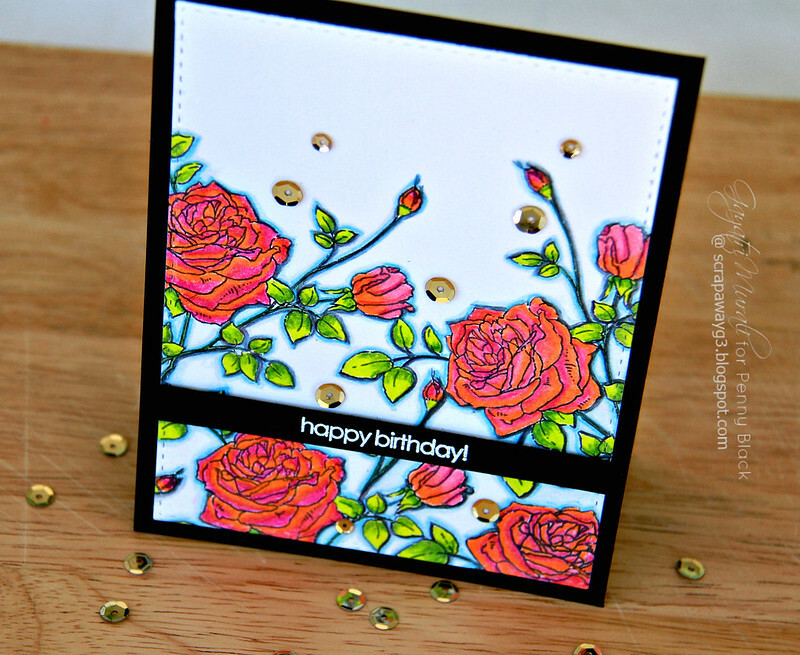 I have used Penny Black’s All Abloom stamp set to make my card. I used MISTI to stamp the rose image on a white cardstock using Simon Says Stamp Intense Black Ink. Then I used Prismacolor pencils to colour. I dipped the pencil into Vaseline box to take a tad bit of Vaseline and coloured as always on the image. I repeated the same with different colours or darker shade and went back to the first colour to blend the colours. Just beautiful colours and blending. I love it. Once I finished one flower or leaves, I dabbed off the Vaseline using paper towel. I did not rub the paper towel but dabbed the Vaseline off. I coloured all the image and then outline all the images to add depth and shading to the images. This makes the coloured flowers and leaves pop. I then die cut a stitched panel out of it, adhered on black card base. The sentiment from Happy Notes stamp set is white heat embossed on a strip of black cardstock. Finally embellished with Metallic Gold 6mm and 4mm sequins from Pretty Pink Posh. Here are both the Penny Black stamp sets I have used to make my card. Both of these stamp sets are available for purchase at Penny Black Store. 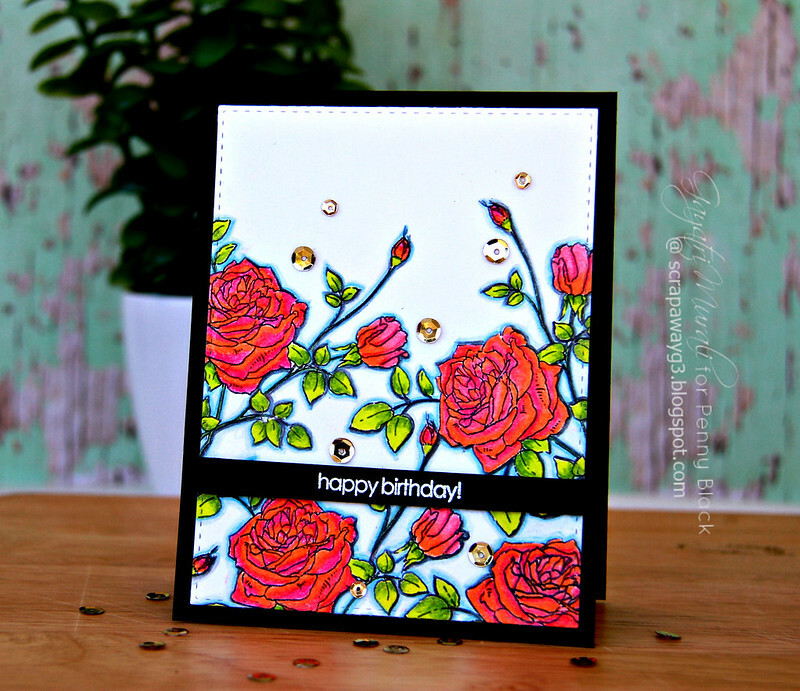 Penny Black released a new collection today called So Special. Beautiful stamp set and gorgeous new dies released. I have a lot of dies on my to buy list. Check them out. So happy the Vaseline technique worked so beautifully! When I went to the store to buy some there was only one jar left on the shelf. Maybe we started something! Gorgeous card! Love that stamp set by Penny Black. Beautiful coloring Gayatri!! Love this card!! beautifully done Gayatri. I really must get myself some Prisma pencils. Beautiful card! I have to try this. Thanks for sharing.